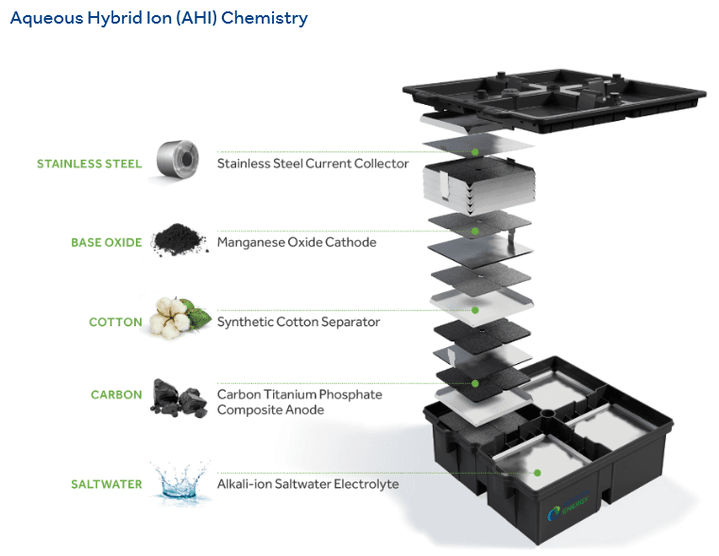 Introducing the first safe and sustainable deep cycle battery.Our unique Aqueous Hybrid Ion (AHI™) chemistry is made from abundant, nontoxic materials. Our deep cycle battery technology contains no heavy metals or toxic chemicals and is non-flammable and non-explosive, resulting in the cleanest and safest batteries for your home or business. Our Aspen batteries are the first and only in the world to be Cradle to Cradle Certified™, an esteemed quality mark for products made from sustainable materials and manufacturing processes. AHI chemistry is composed of a saltwater electrolyte, manganese oxide cathode, carbon titanium phosphate composite anode, and synthetic cotton separator. The battery utilizes non-corrosive intercalation reactions at the anode and cathode. See how we compare to lithium ion and lead acid. The Aspen 48M is a parallel string of twelve Aspen 48S batteries configured as a single, palletized battery unit. They can be connected in series up to 1,000 volts DC. Aquion’s batteries are not flammable, corrosive, or explosive within any environment, states of charge, or use condition as specified in Aquion’s specification sheets and users manuals. AHI batteries have a safe water-based electrolyte. Thermal runaway events are simply not possible in the AHI chemistry. Read more on the safest batteries in the world and watch us try to light them on fire here. AHI batteries have an environmentally-friendly electrochemical design that contains no heavy metals, toxic chemicals, inorganic solvents, or other noxious materials. AHI batteries are safe enough to be disposed via traditional waste streams (always follow local regulations regarding disposal of any product) and are Cradle to Cradle Certified™. Read more about our eco-friendly batteries here. The deep cycle batteries are completely sealed and do not require maintenance. They are self-balancing and therefore do not require an equalizing charge or a battery management system (BMS). AHI batteries have no moving parts like flow batteries, complicated watering systems like some lead acid batteries, and do not require active cell balancing like lithium ion systems. The aqueous electrolyte provides natural overcharge and overdischarge protection and, along with the high impedance of the system, allows AHI batteries to self balance in string configurations. AHI batteries are tolerant to daily deep cycling, wide temperature ranges, and partial state of charge cycling with minimal degradation. In addition to the safety and sustainability advantages of using water as electrolyte, another advantage is the thermal mass of the embodied water means that AHI products neither heat nor cool rapidly. As such, the products can operate in a very wide operating temperature window because they simply take so long to heat and to cool. The AHI chemistry relies on charge/discharge mechanisms which are unaffected by partial state of charge – these batteries can sit indefinitely at partial, or even no state of charge, without irreversible capacity loss like lead acid batteries.